Don’t Skip Skipper’s Fish Fry | RDU Gonna Eat That? Skippers (1001 E. Williams St., Apex, NC) is a place that we heard great things about online and we decided we had to check out for ourselves. After being rather disappointed by the fried fish at the Farmer’s Market, Julia and I were looking for a great place where we could sit down and have a tasty fried fish sandwich. We also have not explored much of the Apex area as far as food goes, so we thought this would be a great opportunity to explore our reach a little bit. I was rather surprised and how full the parking lot was upon our arrival, but I guess I had underestimated the popularity of breaded and fried fish as a Friday night treat. Skippers seemed like a very comfortable, comfort food eatery with its slightly kitschy marine themed decor. On a side note, this yet another restaurant we have gone to and enjoyed that looks as though it is a Hardees that has been converted into something new. The menu was fairly straightforward including several varieties of fried fish as well as shrimp, oysters, clams and scallops. They also had beer, which happily included Yuengling on draft which was a perfect compliment to my fried fish. I ordered the fried fish sandwich platter with french fries, hush puppies, and a coleslaw. My sandwich was two hefty fillets of fish fried side by side which had a nice crispy skin as well as a very tender inside just like it should be. Hush puppies are one of those rare foods where I don’t think I have ever had a bad one; no matter how bad the rest of the meal is, the hush puppies are always good. Once again the hush puppies did not disappoint, but in this case, the rest of the meal was quite pleasing as well. In particular, the coleslaw turned out to have just the right sweet creaminess that I prefer. As my “learning to be a Southerner” lessons have taught me, coleslaw belongs on top of sandwich, where it will almost certainly make it taste awesome. So, the addition of a healthy dollop of slaw and a good dose of tartar, my sandwich was complete and quite enjoyable. I washed it all down with a few swigs of Yuengling and it was a great meal. Julia went with the onion rings and the fried catfish, but it just didn’t turn out quite as good as the meal that I had chosen. According to her, the onion rings were superb, but she wished that it had also included hush puppies like my meal. The catfish was cooked with cornmeal, which made it a bit grainier than she would have preferred. This not to say it was prepared badly, just not in a fashion that Julia liked. 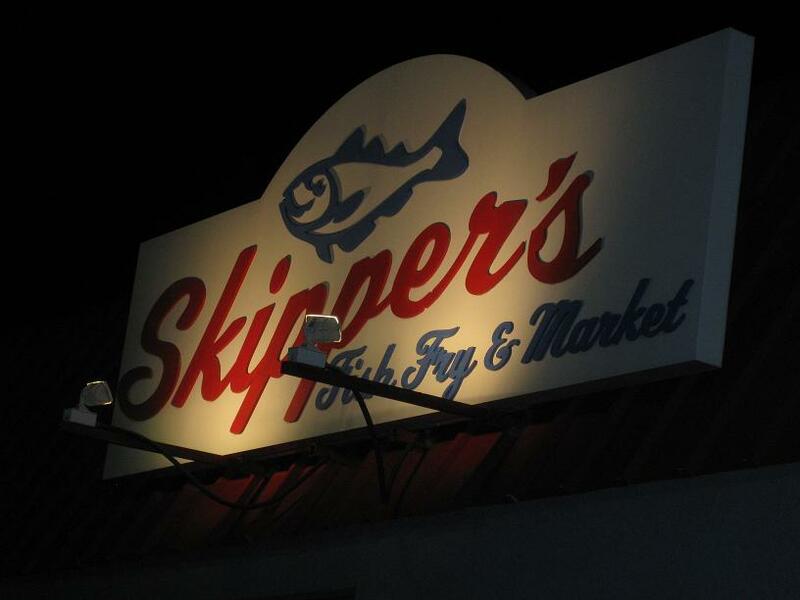 I think we would both definitely go back to Skippers as it served as a really good place to have a comforting meal and a brew after a long week at work. This entry was posted in Apex, catfish, fried fish, hush puppies, onion rings, Skippers, tartar, Uncategorized and tagged Apex, catfish, coleslaw, fish sandwich, fried fish, NC, Skippers, tartar. Bookmark the permalink. I can’t believe you are eating all that fried fish. It looks delicious but not at all healthy. Eat more cole slaw.